The best way to make your tires look like new. Permanent water-based paint applies easily and dries quickly. Won't rub off, even when wet. Gives dull, faded tires a non-glossy, like-new finish. 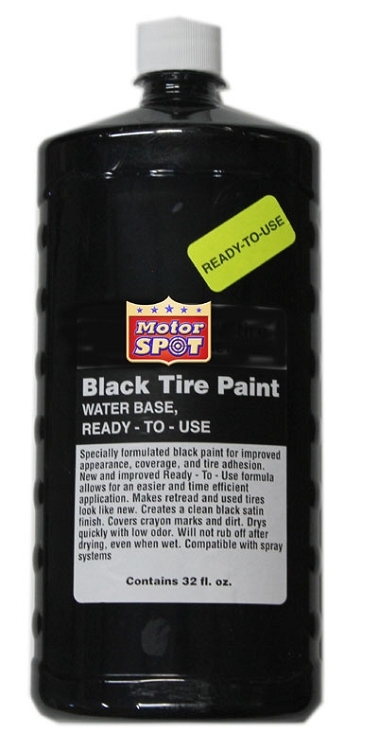 Our black tire paint is more like a stain with the same flat black finish as a new tire. It soaks into the rubber. A quart will cover 4 or more large tires. It does not cover large cracks but will camouflage fine weather cracks a little, as the tire rotates, the cracks open & close, these will be visible after application. We recommend a sponge brush to apply paint but it can be ragged on or sprayed on. Store paint carefully as it will freeze like other paint. Tires need to be free of any silicone based tire shines or polishes before applying paint. Directions: Stir or mix thoroughly before using. Best application is achieved by using a spray system. May be applied with a brush, rag, swab or by spraying. Clean if necessary with warm water. Caution: Keep container cool and tightly closed. SKIN AND EYE IRRITANT. Wear skin and eye protection. Avoid contact with eyes and prolonged or repeated contact with skin. HARMFUL IF SWALLOWED. Do not ingest. For industrial use only. Keep out of the reach of children. Before using, for more specific health and safety information, please refer to the Material Safety Data Sheet available for this product. FIRST AID. For eye contact, flush immediately with water for 15 minutes. Call physician immediately. For skin contact, wash with warm soapy water for at least 15 minutes. Remove contaminated clothing immediately and wash before re-use. If swallowed, do not induce vomiting. Call a physician immediately. FOR SPILL: Soak up with inert absorbant material. Collect and dispose of in accordance with local, state and federal regulations. Flush spill area with water. ADDITIONAL INFORMATION: Store this product in a dry area, at temperatures below 110 degrees F. Keep from freezing. Emptied container will retain vapors and product residue. Do not reuse this container.